PHILADELPHIA — When Debbie Wasserman Schultz spoke to the Florida delegation as the national Democratic convention got underway on July 25, some delegates cheered. The chaos at the Marriott Hotel here demonstrated the degree to which the Florida representative, perhaps the party’s most prominent Jewish leader, had become a divisive figure since she emerged a decade ago as the tyro no one in the party could praise enough. Wasserman Schultz, 49, was forced over the weekend to step down as the chair of the Democratic National Committee, a post she has held since 2011, after leaked e-mails revealed that she and other DNC insiders had little love lost for Clinton’s primary campaign challenger, Sen. Bernie Sanders. The chaos was a radically different scene from the first day of her second term in Congress, in January 2007, when Wasserman Schultz commandeered one of the larger rooms on the ground floor of the Cannon U.S. House of Representatives Office building for her reelection party. But the theme of the party in Cannon was unmistakably Jewish. Staff approached guests to reassure them that the pastrami, imported from a deli in Wasserman Schultz’s South Florida district, was kosher. And the walls were lined with headlines touting a triumph that meant more to her than all the titles Pelosi could confer: Wasserman Schultz, in her freshman term, had passed a law — itself extraordinary — establishing Jewish American Heritage Month. 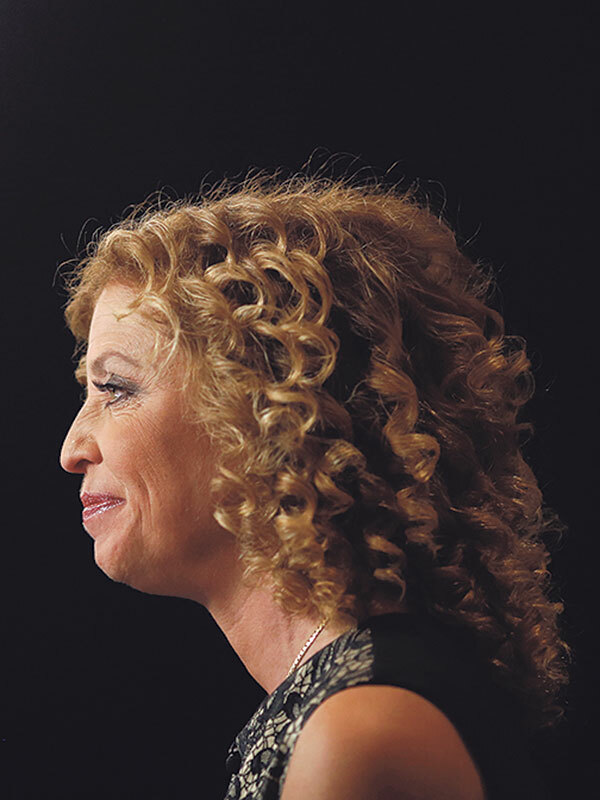 During her spectacular rise, Wasserman Schultz has made her Jewish identity abundantly clear. A typical refrain for her was that she considered her policies not merely as a lawmaker but as a “Jewish mother.” She took time out to attend Jewish events, appearing in 2011 at a roast for Ira Forman, who had retired as the director of the National Jewish Democratic Council — where she had one of her first political jobs in the early 1990s as a gofer. At the 2012 convention in Charlotte, NC, she spent an inordinate amount of time working with Jewish Democrats to push back against the inroads that Republicans were making among Florida Jews. The efforts paid off: Those gains showing up in internal polls were rolled back by November, helping President Barack Obama win the key state. Wasserman Schultz achieved a new pinnacle, chairing the DNC. She brought to the job her prodigious fundraising skills and what had been a talent for balancing effective attacks against Republicans with a sympathetic (to her allies, anyway) presence. Pressures mounted as differences between Obama and the pro-Israel community sharpened, especially during the debate over the Iran nuclear deal. She became one of the most-watched Democrats as the American Israel Public Affairs Committee and Obama’s surrogates took opposite sides over a Republican bid to kill the deal. When Wasserman Schultz finally announced in favor of the deal, appearing on CNN just days before the vote, she again said she was doing so “as a Jewish mother” and wept. Sanders proved a more formidable candidate than anyone — Sanders included — had anticipated, and there soon arose tensions. The senator accused Wasserman Schultz of tilting the scales against him with a debate schedule he said favored Clinton, as well as a reluctance to deliver the assistance that parties must evenly distribute to all candidates. Wasserman Schultz vigorously denied the accusations — until last week’s dump by WikiLeaks of e-mails believed to have been hacked by Russians. There was no smoking gun showing an actual attempt to sabotage Sanders, but there were proposals to do so, the most damaging by Brad Marshall, the campaign’s finance boss, who suggested depicting Sanders as an atheist alienated from his Jewish heritage. Wasserman Schultz is down but not yet out of the ‘16 campaign. Negotiating her exit from the DNC, she secured a senior surrogate spot on the Clinton campaign, and she insisted in sticking out the week. She also said she wanted to speak at the convention, despite the Clinton campaign seeming none too enthusiastic about the prospect, before opting to stay away from the stage just two hours before she was set to open the gathering.